Adopt the aviation light path system , imported linear guide rail , guarantee the smoothness of the light knife moving and high engraving precision . Realize computer drawing (effect drawing) , make all kinds of drawings , characters , graphics context , plenty and normative , cooperate with laser engraving software and make the effect of graphics context perfectly . Large processing area , high speed , high precision , smooth cutting edges , narrow cutting slot , easy working procedure , and easy to operate . 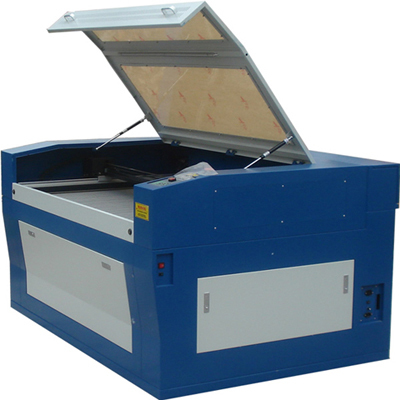 The laser machine adopts imported motor , red light positioning function , private patent inside structure . It's compact , layout reasonable , performance stable , and can continuous working for a long time ; Adopt imported linear guide rail , the light knife moving along with X,Y axis horizontally non touching , no mechanical distortion , perfect engraving effect , adopt CO2 sealed laser tube as the heat sources of the machine , integrate the most advanced computer digital control technique , it's a high-tech digital control product unified optical , mechanism and electricity . Wood , ware , paper , marble , cloth , epoxy resin , density board , double-colored board , leather , plastic , acrylic , rubber , ceramic tile , crystal , onyx , bamboo ware and other non-metal materials . Exclusively supply dual-head laser machine in china , world-leading level large area engraving , unify optical , mechanism , electronics automatic control , computer control , software and kinds of high-tech ; with two separated laser systems , totally shield , working synchronization , multiple productivity . It features high precision , high speed , firmly , easy to maintain , etc. Packing & printing: paper carton, knitting bag, handle bag, rubber board for printing . Advertisement: acrylic cutting, labelmaking, double-colored board engraving. Art and craft: wood, bamboo, photo, ornament, prize’s engraving . Leather & garment: leather, man-made leather, garment embroidery and sampling. Others: sample, marking, model-making, surface drawing decoration, etc.